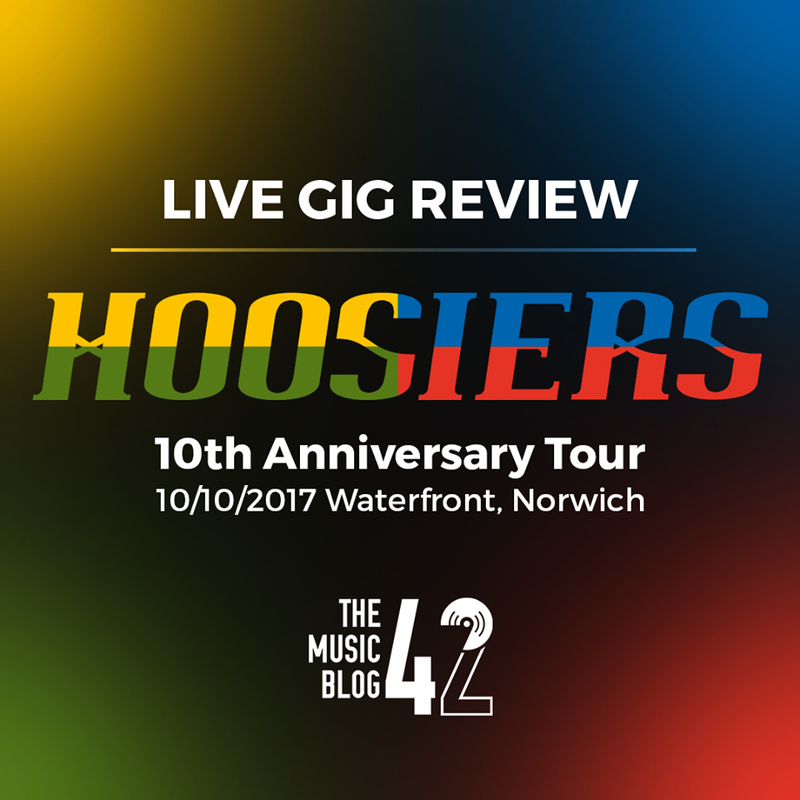 A sprinkling of nostalgia filled The Waterfront Studio on Tuesday night (10th October) when The Hoosiers played to a sell-out crowd. Their 10th-anniversary tour to celebrate their debut record The Trick To Life kicked off with a bang as the band thrashed their way through the epic Worried About Ray and even better Worst Case Scenario then calming things down with the gentle Run Rabbit Run. Arguably their best and well-known song Goodbye Mr A was up next, and my god, what an experience that is live, The Hoosiers were definitely on top form. It’s saddening that a band like The Hoosiers fell away from the mainstream at a time where indie music was gradually fading into the abyss, as songs like A Sadness Runs Through Him and Killer are terribly underrated but shined through on this hit-packed set. Those songs were sandwiched by the relaxing Clinging On For Life and Everything Goes Dark, not to forget the indie groove of Cops and Robbers. Times like these you have to remember that the band have been touring for years, and with that comes vast experience. What the band had was a great creative chemistry, with frontman Irwin Sparkes interacting with the sell out crowd throughout, entertaining them with his facts about Norwich-based falcons and about how they should buy merch from their seller “Mark McMerchMan”. I ramble on about The Hoosiers but two great support acts opened the night, the soothing soulful sounds of Nikki Ambers and the haunting acoustics of Conrad helped warm up the crowd. The crowd were crying out for more after closing with the title track The Trick To Life, and they were sure to come out, finishing off their record set list with the gentle Money To Be Made and spellbinding The Feeling You Get When. The band wanted to show off what they had produced on their later albums, kicking off with the incredible Somewhere In The Distance, and then going into the unreleased song Rules. Covers of We Didn’t Start The Fire by Billy Joel, and Can’t Feel My Face by The Weeknd, which was mixed with Up To No Good, which is arguably the best song they have ever made) went down a treat going into the end of the set. Choices, taken from their second record, rounded off a superb night of indie-pop, and proved that The Hoosiers were, and still are one of the most underrated bands around.